Zenger, Woodstein – and Moore? The real culprit? 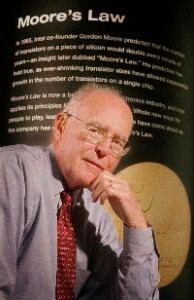 Gordon Moore. What, my journalistic brethren? You can’t quite recall studying him along with John Peter Zenger*, Thomas Jefferson & Woodstein back in J-school? That’s because you almost certainly didn’t – but you almost certainly should now. Moore, the co-founder and former chairman of Intel, observed in a 1965 trade-magazine article that the power of computing devices was doubling every two years. The importance wasn’t that electrical engineers could cram more circuits onto a chip – but that in doing so, the cost of computing would fall proportionately. 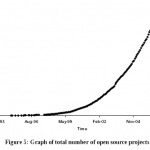 He theorized that the trend would continue indefinitely. Nearly 45 years later, it still holds – so much so that it isn’t called Moore’s theory, it’s called Moore’s Law. To a technologist, Moore’s Law is what the First Amendment is to us. Want to know why you can get a DVD player for 29 bucks? Moore’s Law. Want to know how your cellphone has become so complicated you need a 15-year-old to explain it? Moore’s Law. Want to know why newspapers are collapsing, or why local broadcast stations are becoming little more than a transmitter stick in an empty field? Then stop griping for a moment, and understand Moore’s Law. Exponential equations (doubling every two years) are tricky things to wrap your mind around. It’s not a straight line on a normal graph – it’s a hockey stick (or the right half of a parabola, to get all precise about it). To really get a feel for the numbers, you need to play with them. Dell.com has a spiffy, reasonably functional desktop computer this morning for less than $300. It runs at a speed – does things, in other words – that would have cost $600 in 2007, $1,200 in 2005. 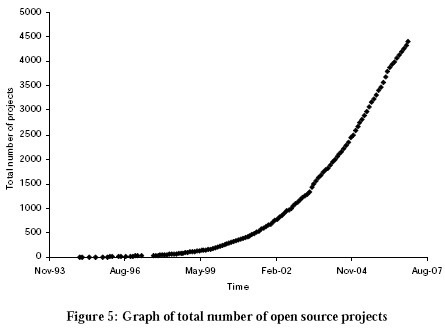 OK, you say, got it: computers get better over time. But do you really get it? Keep going: The same performance would have cost nearly $20,000 10 years ago, at the height of the digital bubble. Not so long before that, when I was studying Zenger, Jefferson et al (and playing poker all night) in college, that much computing power would have cost nearly $5 million. Meanwhile, some kid who understands Mr. Moore’s relentless math is chasing after that idea for under $30,000. Therein are the roots of the woes affecting Old Media. Our audience now has endless choices of news and information because you don’t need a $120 million printing press or a $50 million TV license anymore to publish. As Jay Rosen noted nearly four years ago, the people formerly known as the audience are now collaborators and potential competitors. For the same reasons, our advertisers have the same sort of cheaper options. The local restaurant that used to buy a 2×5 coupon ad every week? Publishing their own coupons online, and laying our zero cash for a marketing program from Groupon. The car dealer? Using cars.com and AutoTrader for about $2,500 a month combined instead of buying a full-page ad for $10,000 a week. But “stop blaming the wrong people” is only half my intended message. Why did we bother to study Zenger and Jefferson? Why are they considered heroes centuries later? Because of their spirits of daring, the possibilities they opened for us. We should understand Moore’s Law now for precisely the same reasons. Yes, it has been a gigantic sledgehammer that has shattered the underlying business models of mass media, and it isn’t going to be repealed any time soon. It also helps to remember that hammers are used to build things, too. Instead of looking back, face the other direction. Pick up the hammer, and start thinking about what you can do with it. Certainly that’s what my work is about these days. But I’ll pontificate some more about what kinds of things you can do with the hammer in a couple of days.